The present generation of 30 to 40 year olds out there will no doubt one day reminisce themselves about King Kenny to their grandkids and rightly so, Kenny was the most outstanding talent of his time and deserves all the plaudits they will give him. Rushie will also have his apostles and his goals record I believe will never be beaten, that's right never! Indulge me for a while and try and imagine with this Old Fogey if our greatest player Billy Liddell had been born in 1981 and had been blessed with half the footballing talent that those that saw him play knew he had. He would now once again be a strapping 21 year old and just beginning his career. He'd have just signed a lucrative 5 year contract and would be a millionaire in the making. Liverpool and Scotland would be boasting a world class footballer, something Scotland would die for at the moment. The Kop would drool over his every touch and we would have a winger who was likely to score 20 goals a season. "3 goal a season" Damien Duff eat your heart out, this new winger can really play and has a ferocious shot in both boots. His popularity would not only rival that of Robbie Fowler and Michael Owen, it would dwarf it. The club shop would do a roaring trade in replica shirts emblazoned 'LIDDELL 11'. Funny really as Liddell played most of his games without a number. The media would no doubt be full of speculation of the possibility of £35 million swoops from all the top European clubs, including the likes of Juventus, Inter or AC Milan, Real Madrid or Barcelona. But there would be no chance of Gerard Houllier parting with the jewel in the Anfield crown. Imagine as well a Liverpool attack boasting Liddell, Heskey, Baros, Owen and Diouf! I know it sounds daft, but in those days 2 wingers, 2 Insides and a Centre forward was the norm. We would be the scourge of the Premiership and the giants of Europe would bend at the knee in his presence, but Billy Liddell would have probably hated it all as well, because he was a very modest man. 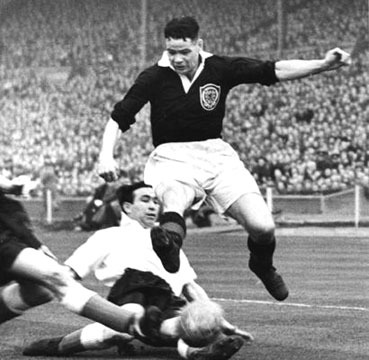 He was above all the stuff and nonsense of the so called great players of today, Yes, there was only one Billy Liddell. "One Billy Liddell, there's only one Billy Liddell"
"He gets the ball, he scores a goal, Billy, Billy Liddell. "I'd walk a million miles for one of your goals, oh BILLY"
"Left foot Goal, Right foot Goal, up with his head and its another Goal". Hat-trick king Liddell strikes again. Billy strikes more often than the miners, Fords and Standards does together. OK dream over, Billy came from a different era, but I still doubt he would have been seen celebrating a goal by running to the corner flag or worse diving along the floor. 'sniffing' the touch line? I think not. Also despite his God given talent he would never earn more than the majority of his team-mates of the forties and fifties. His career came to a finish with players earning around twenty quid a week, plus a few extra pound notes if they won and not the £40,000 a week earned today. Fair enough, back in the fifties that sort of money would have meant a reasonable standard of living, but it was hardly the sort of money that would allow a footballer to retire once he turned thirty, let alone drive around in custom made cars. You were more likely to see Billy riding a bike! Today we fans often get criticised for daring to criticise the multi millionaires that are supposed to be entertaining us. The players did not create the ever increasing wage bill, rather it was directors who offered the money and lengthy contracts. So all this furore about asking players to take a cut should, well first tell their directors to look at their own wages and then beggar off. Following the Treble year, the Kopites were a happy bunch and so, no doubt, were all the players as their bank balances increased by a few more noughts. Throughout the nightmare nineties we had players earning a mere ten grand a week complaining that they were underpaid. In Billy's day fans would vent their feelings, probably far more strongly than they do today, if they thought that someone wasn't pulling their weight, but even during the worst of times nobody could ever level that charge against Billy Liddell and the Famous Kop never booed the team off the pitch. No manager ever had to tell Billy Liddell to go out and do his best because Billy never gave anything less than his best in every game he played and he played EVERY week. I argue with mates regularly about the pampered and over protected players of today. I am more of a cynic now than I ever was. People try and tell me how different the game is now and I have to agree that it has changed. But Billy Liddell never had the benefit of being part of a thirty-man squad. The manager couldn't rotate the team then and anyway if any of them had been brave enough to drop Billy Liddell the walls of the Kop would have come tumbling down around their ears. The game in the fifties might have been different but the likes of Billy Liddell would face uncompromising defenders week in week out and those defenders would have one thing on their mind and that would be to kick Billy Liddell as hard and as often as they could. Did Billy roll around the pitch like he'd been shot? Of course not, he just picked himself up and carried on. If someone kicked him on the right leg, he'd start shooting with his left, if someone kicked him in the left leg, he'd just shoot with his right. Many defenders thought it wise to kick him in both legs, what was Billy's answer? Yes, you're right, he'd head the ball home from anywhere in the area. Can you think of any attacker now who can boast the same? Owen is a world class striker, there is no doubt in my mind, but I aint kidding when I say me Mam could kick a better ball with her left peg than Mikey. Heskey's talent of playing in a variety of roles and trying his best wherever he plays is admirable, but the chances of him scoring as regularly as Billy did is about as likely as the Mersey Tunnel stopping the toll (anyone old enough will remember it was only going to be tolled for the first year).